04 Jul Too sick to work? Should you take sick leave? Getting sick is an inevitable part of life, with some people being more susceptible than others. Viruses, infections and accidents can strike without warning, typically when life is hectically busy at work or at home. So, on top of feeling rubbish, there are always going to be other tasks and to-dos that need to be prioritised. But when should you rest and when should you plough on? What is the best and most productive way to manage yourself through illness? We asked our doctors for their professional input on how to get back to normal life as quickly as possible. 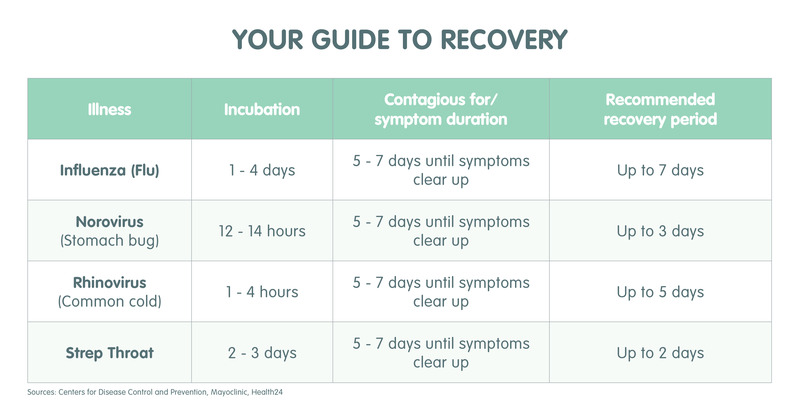 Here is a useful table to give you an idea of how long it takes to recover from some common illnesses. In the case of germs, sharing is not caring. It is best to stay home if you are contagious as you will risk making your colleagues sick. Diseases like the flu or the norovirus (stomach bug) spread easily through airborne droplets, human contact and shared surfaces. This means they quickly spread in public spaces, especially open-plan offices with shared kitchens and bathroom facilities. If you have diarrhoea or vomiting, make sure you stay off work for at least 24 hours after the vomiting has stopped and 48 hours after the diarrhoea has stopped. If you are struggling with a fever, don’t fret, it is your body’s natural way to fight off infection. Stay home if your temperature is raised and let your body fight off the bugs. It is best to wait for 24 hours after the fever breaks to be sure that you are no longer contagious before going back to work. If you have a cold and feel better with medication then feel free to go to work, but make sure to reduce the chances of spreading the infection by washing hands regularly and sneezing and coughing into a tissue. It’s a good idea to use hand sanitizer. Not taking the time to rest can make your illness last longer. For the sake a couple of days off, you might save yourself from a longer period of sick leave. Don’t push yourself and listen to your body. If you do not feel well enough to go in to work then stay home and rest. On top of this certain medications can make you feel drowsy: your doctor will advise you if this is the case. Try the medication out before going to work to see how it affects you. If you cannot concentrate then do not go in until you feel better without the medication. If you are not sure, you can ask your doctor to advise you on how long you should take off work. 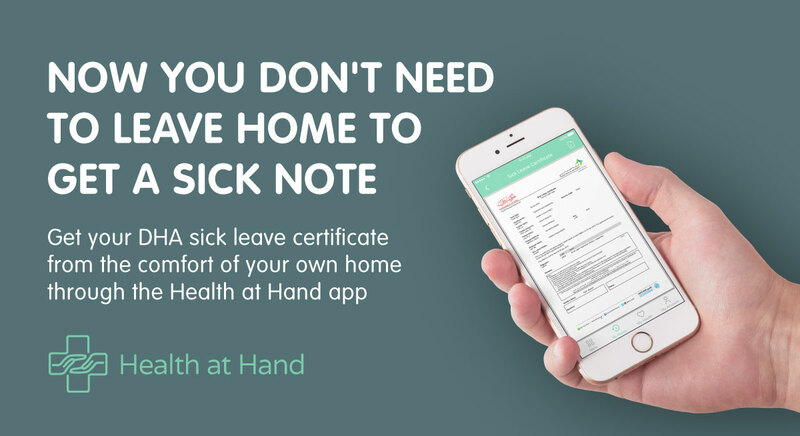 It’s very easy to download sick leave certificates issued by Health at Hand doctors, allowing you to share directly with your boss or HR department and documented correctly on your employment record. To speak with one of our doctors and get a sick certificate, download the app today.